I read something this past week that peaked my interest and had me considering once again what we truly want and whether what we want is beneficial for us or if what we want is what we think we ‘should’ be doing. And what if how things worked in the past is no longer how anything works now? For example: what if the teachings of the Law of Attraction could work a lot better if some of the rules were tweaked? I have been talking for years about how we need to focus on BEing instead of doing and that it isn’t the outcome of our doing that we necessarily consider as our goal but rather our ‘BEingness’ – but this week I came across a teaching that really hit it home as it encouraged me to contemplate what motivates us. When we focus on the outcome we are always searching for the results we intend. We are disappointed when we don’t get the results and this disappointment could completely spiral us out of the direction the Universe has been guiding us toward! For years I have spoken about focusing on how we want to feel instead of a goal. And many spiritual teachers suggest that it is the journey not the destination. When we focus on how we want to feel – happy, loving, compassionate – we shift our focus to something that we can control or are in charge of: Ourselves and how we want to BE! And as we control the experience of our feelings in the journey we can enJOY the journey and, again, how we feel is something we are in charge of. The spark this week was to focus on Love and Acceptance of what we are desiring most. This would fit in with our motivation – to take our goal, say ‘vitality’ or ‘health’ and shift the focus to desiring it because we Love Vitality or we are in full Love and Acceptance of a Vital Healthy body. Or in the case of desiring to make more money – it would be because we Love and Accept the work we do completely. It isn’t lost on me that my ‘goal’ since 2017 is to have Love and Acceptance. My mantra has been: ​​“I choose to step Easily and Graciously into Radiating Unconditional LOVE and ACCEPTANCE while acknowledging the DIVINE within everything.” And I have also included the mantra: “I am making Choices that lead to the Highest VIBRANT HEALTH offering greater Opportunities for Freedom, Energy and Peace.” With this new inspiration appearing this week I believe that my exuberance for creating Love and Acceptance – as a part of my Being – can motivate me to bring Gratitude into my other desires. Gratitude opens our Hearts and shifts our vibration to higher states so that we can enjoy a Heart-Centered Life experience. When we focus on Love and Acceptance we allow Gratitude into why we are desiring these shifts. We move away from a ‘goal oriented’ ambition towards a Heart-Centered Life Intention. We can take any goal that we want and turn it into a new way of BEing. Using Love and Acceptance we can allow Gratitude to enter into our Life Mission. Take any goal and examine why you want it and how it would benefit your life. Most of our top resolutions tend to be around health, whether it is an addiction like smoking or drinking (or sugar) to eating better or becoming more fit and even bringing balance into our lives. These all can be shifted towards what you would be most grateful for – using more Love and Acceptance. Health, Vitality, Joy, Abundance, Compassion – turn your goals into Heart-Centered Life Intentions. When we focus on our goals as an end target or destination we only feel better once they are achieved. This limits and restricts how we feel during the process. We are always establishing – or worse judging –our self-worth from whether we are on target. We are constantly determining whether we are achieving these goals and therefore when we examine where we are compared to where we want to be – we bring fear into the equation through seeing where we aren’t or due to our expectations not being met. Once fear is brought up – because we haven’t seen any changes or our time schedule hasn’t been met or we back-slid on a promise to ourselves – we reprimand ourselves, judge ourselves and lose Self-Worth – if not a little Self-Respect. So, what can we do to change a goal or outcome towards our Motivation of Love and Acceptance? Let’s look at what we are Grateful for when we consider our desires. What do we Love about what we are Wishing for? Where can we find Acceptance as a Life Intention? It is always about perception. There is nothing wrong with having a goal – it is how we look at that goal that may be the problem. It is whether we can shift our motivation and intentions with respect to the goals that we set. It is whether we continue to add to our Story of unworthiness, abandonment and separation or inspire ourselves to be in charge of how we want to feel or BE within our Heart-Centered Intention. Words are important but it is the feeling behind our words that give us the motivation and energy to create Heart-Centered Intentions. Goals are just words and if we focus on how they aren’t working or what we don’t like within these goals then we are going against the flow and making life challenging. Sometimes we need challenges to motivate us so here and now I invite you to consider empowering your goals in a whole new way. Use the Unlimited Power of your feelings – how you want to BE – to inspire yourself to create Motivational Intentions with Love, Acceptance and Gratitude. 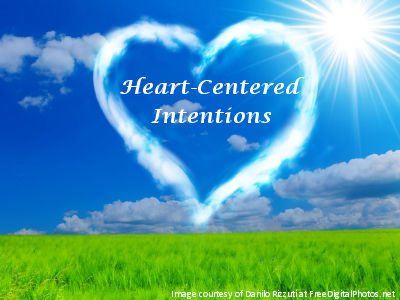 Share your Heart-Centered Intentions on my blog or Facebook! This entry was posted in Blog and tagged Heart-Centered Intentions, intentions, Intuitive Counseling, intuitive counselor, Laurie Huston, Law Of Attraction. Bookmark the permalink.